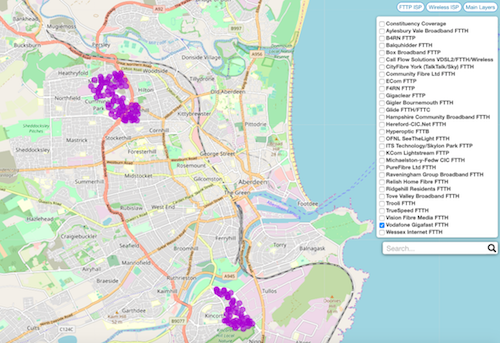 Aberdeen has been waiting a long time for an ultrafast broadband option and now the Vodafone Gigafast FTTP service is starting to roll-out in the city more residents are starting to have the option of 100 Mbps to 900 Mbps connections as we have spotted a second area where the full fibre service is available to order. The Gigafast footprint across Aberdeen, Milton Keynes and Peterborough that we know about is covers 17,911 premises. Update 11pm: Further coverage has been found in the Kincorth area of Aberdeen, postcodes and maps have been updated. Total footprint therefore has risen to 19,111 premises.